Astronomers using the Karl G. Jansky Very Large Array (VLA) have discovered jets of material ejected by still-forming young brown dwarfs. The discovery is the first direct evidence that brown dwarfs, intermediate in mass between stars and planets, are produced by a scaled-down version of the same process that produces stars. The astronomers studied a sample of still-forming brown dwarfs in a star-forming region some 450 light-years from Earth in the constellation Taurus, and found that four of them have the type of jets emitted by more-massive stars during their formation. The jets were detected by radio observations with the VLA. The scientists also observed the brown dwarfs with the Spitzer and Herschel space telescopes to confirm their status as very young objects. 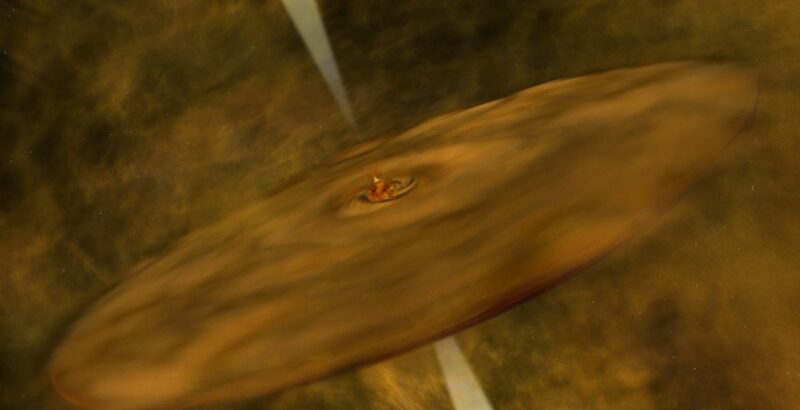 “This is the first time that such jets have been found coming from brown dwarfs at such an early stage of their formation, and shows that they form in a way similar to that of stars,” said Oscar Morata, of the Institute of Astronomy and Astrophysics of the Academia Sinica in Taiwan. “These are the lowest-mass objects that seem to form the same way as stars,” he added. Brown dwarfs are less massive than stars, but more massive than giant planets such as Jupiter. They have insufficient mass to produce the temperatures and pressures at their cores necessary to trigger the thermonuclear reactions that power “normal” stars. Theorists suggested in the 1960s that such objects should exist, but the first unambiguous discovery of one did not come until 1994. A key question has been whether brown dwarfs form like stars or like planets. Stars form when a giant cloud of gas and dust in interstellar space collapses gravitationally, accumulating mass. A disk of orbiting material forms around the young star, and eventually planets form from the material in that disk. In the early stages of star formation, jets of material are propelled outward from the poles of the disk. No such jets mark planet formation, however. Previous evidence strongly suggested that brown dwarfs shared the same formation mechanism as their larger siblings, but detecting the telltale jets is an important confirmation. Based on this discovery, “We conclude that the formation of brown dwarfs is a scaled-down version of the process that forms larger stars,” Morata said. Morata led an international team of astronomers with members from Asia, Europe, and Latin America. They reported their findings in the Astrophysical Journal. 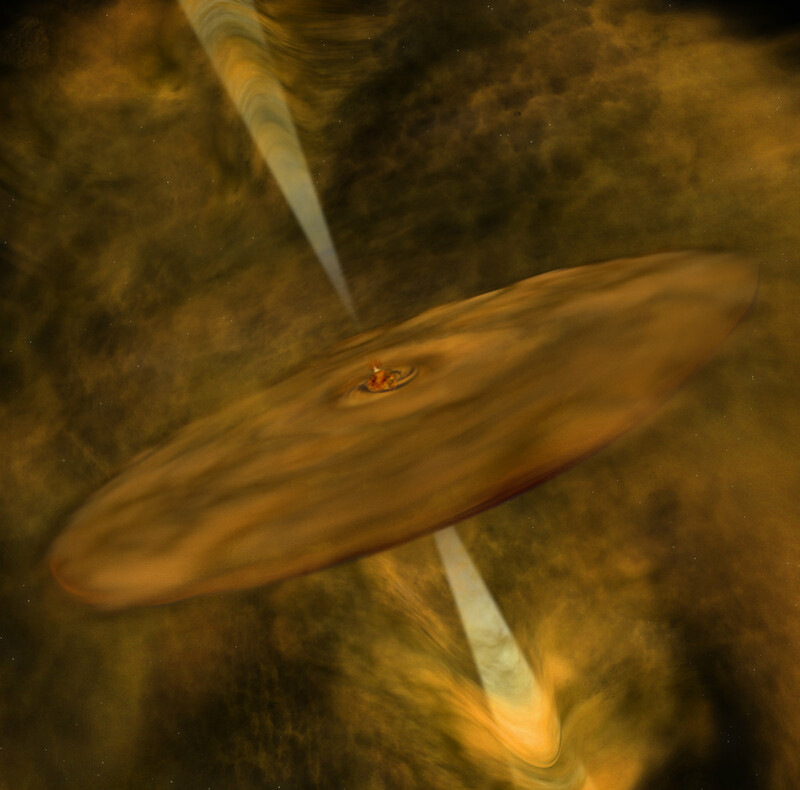 Artist's conception of a very young, still-forming brown dwarf, with a disk of material orbiting it, and jets of material ejected outward from the poles of the disk.